Custom handmade wedding anniversary gift. Traditionally the 5th anniversary is celebrated with the exchange of wooden gifts. This wooden photo album can be custom engraved for your family. 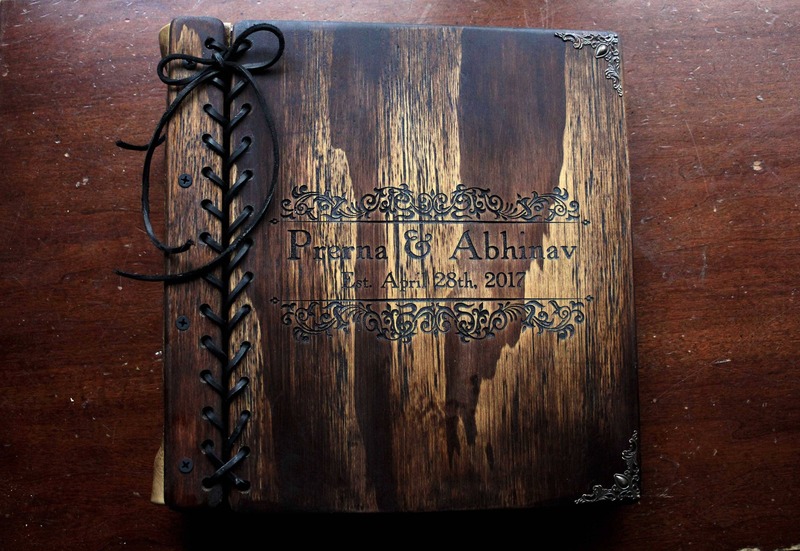 This handmade wooden book makes an excellent wedding photo book and has just the right amount of space to comfortably fit two 4x6" or 5x7" photos per page with notes - A perfect way to store your wedding memories. You can squeeze in more photos but it isn't recommended. 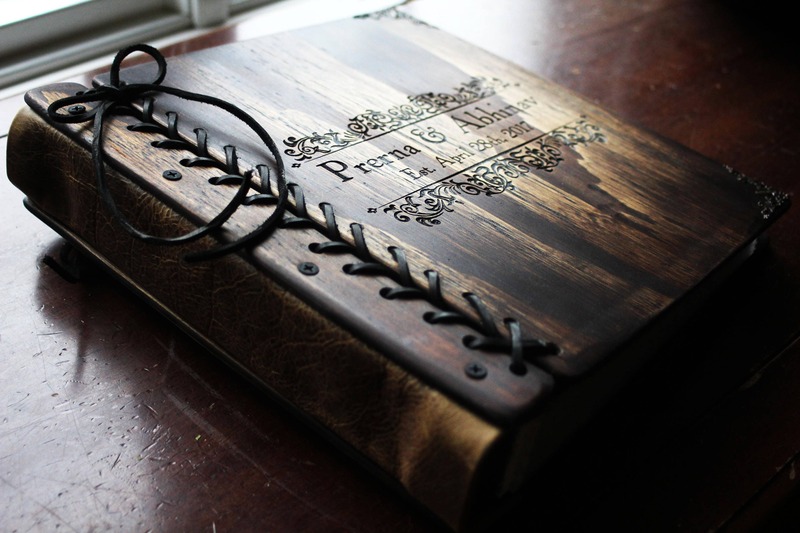 This book is crafted to order from hand cut, sanded, and stained wooden sheets. Each piece of wood is carefully and artistically stained using a layering technique to give it a unique dark rustic look. Genuine cowhide leather is rubbed with mink oil to bring out a nice leathery smell and is formed into the spine of each book. 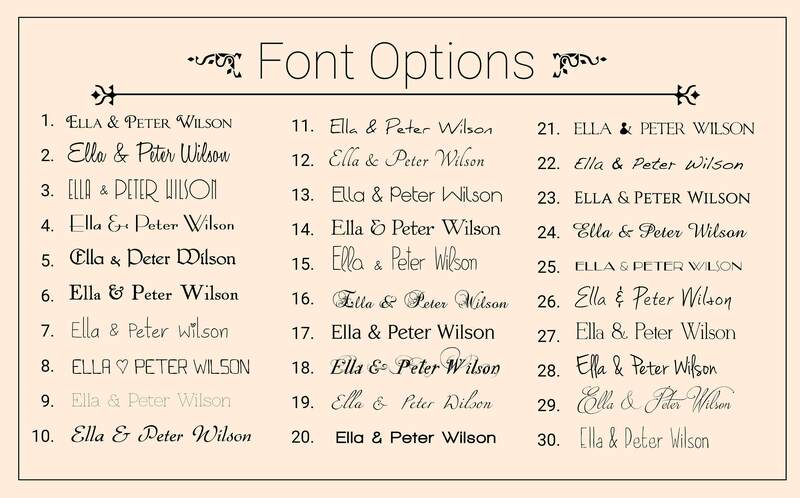 Once the book cover has been made, your monogram is laser engraved into it or a personal message can be added. Each book comes with your choice of cardstock, cardstock overlaid with clear acid free plastic sheets, or archival quality acid free 8.5" X 11" photo sleeves. Slotted album sheets may be available by special order. 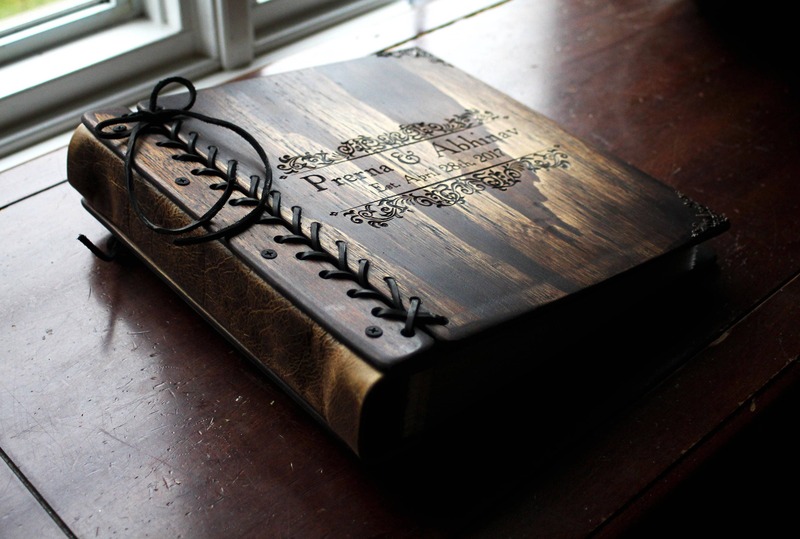 This book is made to have very rustic look and is made to hold a large number of pages while opening flat. 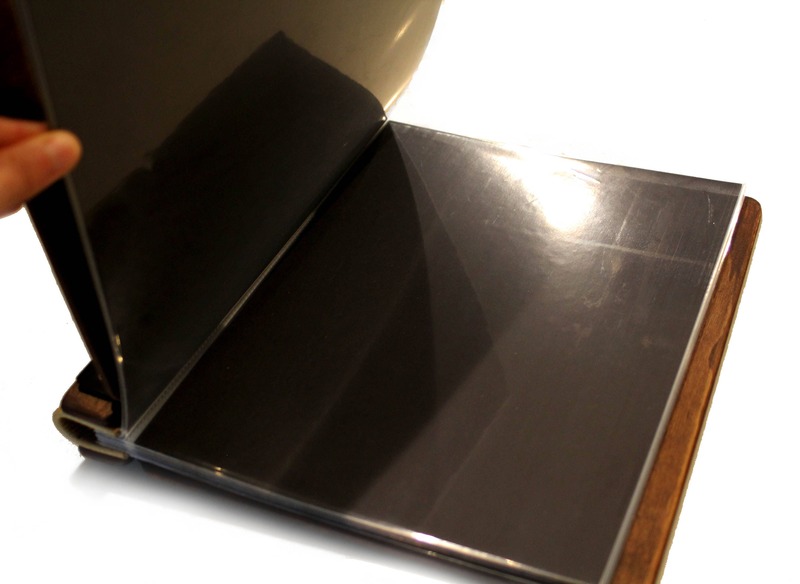 This custom book is made with a hinged back cover so the pages lay flat when the book is opened for better viewing. Each book is custom made to fit the exact number of pages ordered so thickness will vary. The book shown has 100 album sheets. 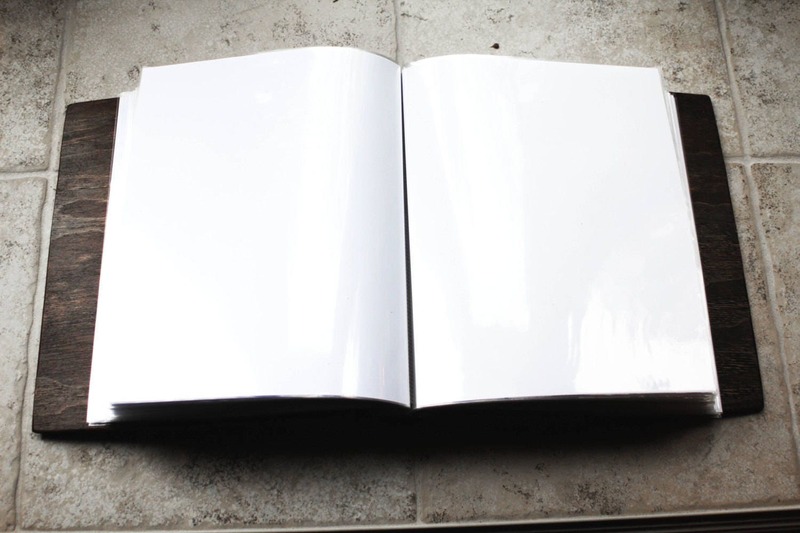 *THIS BOOK COMES WITH WHITE PAGES BUT YOU CAN HAVE IT MADE WITH BLACK PAGES BY MAKING A REQUEST DURING CHECKOUT. **PLEASE ALSO MAKE A REQUEST FOR ADDITIONAL PAGE SPACERS DURING CHECKOUT IF YOU ARE USING YOUR BOOK FOR INSTANT PHOTOS. The books I create are made to last! Each book is carefully constructed to ensure its durability while maintaining a unique character and a beautiful rustic yet modern look. These books are made to be displayed for a lifetime and the customized engraving adds a personal touch that will be cherished. These books make wonderful personal albums and gifts. If you need your book urgently, you can upgrade to a priority/rush order with express shipping. Over night shipping is also an option. To make a request for an urgent order listing please contact me and I will do my best to accommodate you. - The pages are hand creased acid-free premium heavyweight cardstock that will not degrade your photos, writing, or artwork over time. - This option includes alternating pages of premium cardstock (described above) and acid-free clear archival plastic sheets (every second page is clear plastic). This option makes it easy to access the cardstock to write on or adjust photos, but still adds a layer of protection when viewing the contents of the book. Both the cardstock and the plastic are acid free/archival quality and will not degrade your photos, writing, or artwork over time. 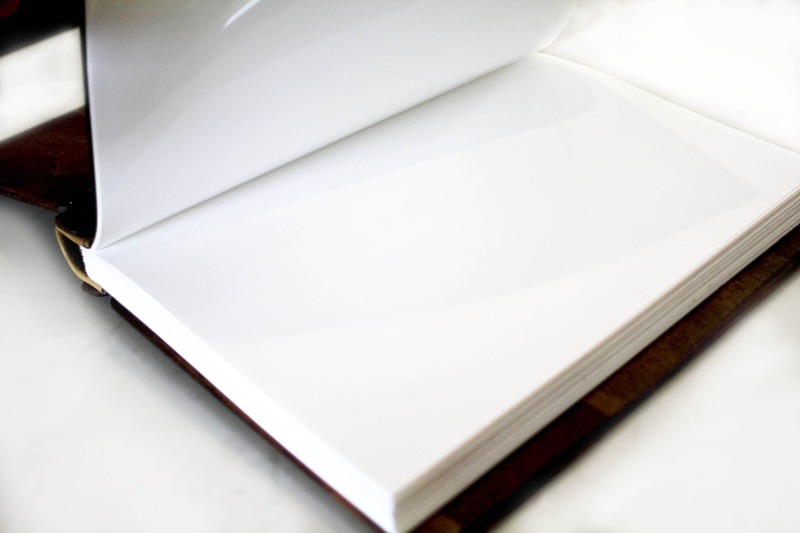 This is a great option for photo guest books, poetry books, sketchbooks, or any book where both sides of the pages are being used and smudging may be an issue This is also a great option for scrapbooks, photo albums, or any book where easy access to delicate archival material is ideal. To select this option choose “cardstock/clear”. - This option includes scrapbook style photo pockets (one large pocket encasing premium heavyweight cardstock). These clear pockets are inserted with premium white cardstock and they are ideal for photo albums, baby books, scrapbooks, and archival of any delicate material. To select this option, choose “album pages”. Photo pockets can be used in wedding guest books if you plan to add pictures to it only if the pages are being filled out then added to the book at a later time, otherwise this option is not recommended for guest books. Removing the cardstock from the protective sleeves and then re-inserting it can make signing your guest book a challenge for your guests. You can visit rusticengravings.com for more detailed info on page options along with photos. The word 'wisdom' may appear on the back cover. Wisdom is my last name and my way of signing (or branding) my work. I wont include this if you don't want me to. Just send me a message asking me to exclude it.